Whether you are staining the deck, reimagining an interior space or painting the whole exterior, we carry a Benjamin Moore paint or stain that fits your project. Aura delivers remarkable durability and offers the most advanced way to bring color to life. This paint utilizes Benjamin Moore's® exclusive Color Lock® technology, Aura paint brings you discernibly richer, truer color. Visibly thicker, Aura paint covers like no other—even in the deepest shades. Regal Select offers the premium performance and smooth application you've come to expect from our classic paint, with the added benefits of cutting-edge new technologies. Thanks to Benjamin Moore's® proprietary waterborne resins and zero VOC colorants, Regal Select is both a paint and primer in one advanced formula. Ben® offers great value with all the performance qualities you expect from a Benjamin Moore product. ben is a zero VOC/low odor paint that applies easily, is very durable and covers well. Regal Select Exterior with MoorLife®, MoorGard®, and MoorGlo® finishes are 100% acrylic fortified with advanced alkyd technology for superior adhesion, especially to chalky substrates. Tinted on Benjamin Moores® proprietary Gennex platform, these mildew-resistant, high solids coatings are designed to deliver advanced protection and adhere beautifully to hard-to-coat substrates — creating a durable, robust finish. Regal Select Exterior REVIVE for Vinyl Siding is specially formulated for optimal performance on vinyl siding and trim, giving your home a fresh look in just the color you want. Made with proprietary Vinyl Lock technology, Regal Select Exterior REVIVE provides long lasting beauty and protection, whether you are looking to refresh your faded siding with a color close to the original or it's time for a dramatic change. Ben®Premium Exterior latex paint is a 100% acrylic latex paint that delivers dependable performance, application and appearance. It is premium quality, environmentally friendly with low VOC and is designed to meet the needs of a value conscious consumer. ARBORCOAT Premium Exterior Stains offer a variety of opacities in an array of captivating colors that let you express your own unique style. These finishes are designed to enhance the appearance of your deck, siding, or outdoor wood furniture with outstanding color retention. All ARBORCOAT finishes are easy to apply and offer superior protection while enriching the texture and grain of exterior wood surfaces. 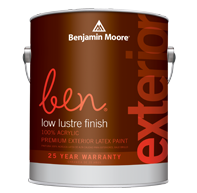 Benjamin Moore's® Fresh Start premium primers come in both latex and oil based formulations to ensure the best possible results by providing the proper foundation for every finish coat. They combine the excellent adhesion and sealing desired in an interior primer with the added benefits of being low odor and quick drying. Choose from specialty products that solve problems with stains, moisture damage, and other common issues. Benjamin Moore's® line of exterior Fresh Start premium primers ensure the best possible results, especially when sealing and priming new or previously painted wood and weathered surfaces. The need to use these products varies from job to job and can range from problems with stains, moisture damage, cedar or redwood bleeding and other common issues. Here are the products to choose from when needing an exterior primer.